Like most humans, I have forgotten far more than I will ever remember. Our memories are akin to a series of short films or a highlight reel—tedium has to be tremendous in scale for us to recall it. We are probably lucky for this—the hours lost to bureaucracy, waiting in lines, waiting in traffic, waiting on others, et al. We retain only the highlights of our lives, the first kisses, the extreme violence, the romance, the pain, and the embarrassing. – Visa anxiety as I waited to go through customs in Mexico. Americans still aren’t allowed to go to Cuba, other than by obtaining a special visa for educational or relief purposes. I’d paid a tariff to have an extra signature of pages put into my passport so that no Cuba immigration stamp would land in my passport. – The anticipation of fuselage smoke in the Cuba Air shuttle plane that never emerged. – A sign outside a Havana discotheque which read “Tourists will be assaulted here” in Spanish. – Strolling through a warehouse full of vegetables, fruits, and tubers from organopónicos, urban organic farming stations that criss-cross Cuban cities—the gardens an answer to the lack of support from the fallen Soviet Union in the new century. – A dog gnawing the skull of another dog in Trinidad. – Sitting on a beach chair sipping rum next to the ocean in Playa Ancon, tapping out an essay for Slanted on my phone while my wife, clad in a turquoise and salmon-colored bikini, takes hundreds of photos of the reflected surface of the ocean in a vain attempt to capture the beauty of the fish nibbling at the dead skin of her feet. – Being asked for money by new Cuban acquaintances and complying. – Being asked for money by new Cuban acquaintances and refusing. – Being sick of being asked for money and instead asking new Cuban acquaintances for money, cutting them off at the pass. – Chatting with a guard outside a Havana cigar factory, plumbing the depths of my high school Spanish language education. – Meeting a farmer who is the spitting image of Ronald Reagan on the side of a highway, a package of cane sugar candy in his outstretched palm crawling with fire ants. – An extra-malty bottle of beer with a polar bear on the label downed while walking Havana’s back streets, it hitting the spot in a way that few drinks do. – An unofficial taxi driver telling myself and the three other tourists in the car from Havana to Trinidad how much more money he makes on these quasi-legal trips than pursuing his regular work as an emergency room surgeon. – Chatting with a young man with a PhD in finance and who is fluent in English, German, French, and Mandarin about his most rewarding employment option: working in his grandfather’s gift shop in Trinidad selling wicker knick-knacks. – Illicitly watching some members of the Buena Vista Social Club make their way through their repertoire of music onstage through the window of a nightclub from the street. – Days of walking across Havana, taking in the general streetscape, photographing signage as we traversed the city. This final scene is the one that will have the most resonance with Slanted readers—documenting vernacular signage has become a collective pastime for designers over the past number of years, codified as much in print (Ed Fella’s Letters on America) as on-screen (Instagram). Designers shoot photo after photo of sign after sign, but often take little notice of the socioeconomic environment that may bring examples of signage to life. This is what makes the signage of Cuba such an amazing repository of inspiration: the years of economic embargo, an economy flooded with products from Soviet-allied nations, and a dearth of American brands, complemented by an economy that limped along in the 1990s. The Cuban experience is so utterly singular in the contemporary global scheme that it must be noted, particularly in the realm of graphic design. Computer access is restricted to the very few Cubans who work in finance and in international trade, and internet access is illegal for the vast majority of the Cuban populace. Watching foreign television is illegal, and domestic television is heavily censored. What this means to Cuba is that the realm of signage and commercial lettering is part-time capsule (most large-scale signage being holdovers/relics from before the Revolution) and part indigenous stylistic development (because of the dearth of foreign influence, lettering and signage in Cuba has its roots in what was available pre-Revolution, and what Cuban designers and sign painters have spun out of it since then). There are virtually no adhesive vinyl plotters in the country—the bulk of the signage being produced by hand using the time-honored methods of paint and stencil. This immediately sets Cuba apart from global standards and trends of design in history. Cuba is a country where the Swiss/International Style never took hold of either corporate or public life, leaving an alternate history of graphic design. The contemporary global trends of lettering and graphic design have not been viewed by everyday Cubans, and the technological means of reprographics, utilized even in Third World nations elsewhere, do not exist. Instead, Cuba has charted its own course in design and lettering. Cuba is populated with Latin variants on the work of Roger Excoffon, broken calligraphic-style scripts, Roman/Blackletter hybrids unseen elsewhere, a sprawling and detailed infatuation with decorative Latin scripts, expressive Schwabacher calligraphy, and an enduring infatuation with slightly cartoonish sans serif capital alphabets, which signify exotica, retro aesthetics, and notions of a rosy Tropicalian age to many who are studied in the forms of letters from abroad. These new developments in lettering are complemented by holdovers from days gone by: massive wood type-inspired building signage, grotesk capitals such as those found in New York that inspired Hoefler & Frere Jones’ Gotham, and traditional Blackletter of yore. These dot the city, some coated in the patina of age, paint flaking off and others crumbling—architectural signage cast in concrete succumbing to decades of neglect in a tropical climate,1 inlaid marble lettering worn through, and aged plastic signage sun-faded and nearly illegible. If and when trade barriers come down, as they inevitably will— the increased influx of foreign capital and the mixture of state-run and privatized corporate tourism in one area of Havana’s downtown is testament to this2—how will Cuba change? What will its designed landscape of the future look like? Will the monumental lettering adorning buildings be restored to their former glory? Will the entire country get run over in adhesive vinyl and a hyper-speed scramble to catch up with the half-century of graphic design history that it missed out on?3 Indubitably, the pre-Revolution classic cars that litter the cities will hang on as a tourist attraction, but what of everything else? – Visa anxiety as I waited to go through customs upon re-entering the United States for the holiday season. I had two Mexican “landing” stamps in my passport and a missing trip to nowhere in the middle. I turned to my wife and asked her to amp up the excitement level when we reached the customs agent as if we had just gotten married not four months previous. We giggled and hugged and gushed over our fabulous Mexican honeymoon to the agent, practically making out as a distraction, which somehow worked to obfuscate that I went to a country where Americans are not supposed to go, whose people are both brutally and benevolently repressed, and I was able to document something of it, while somehow forgetting almost everything. 2 It’s only semi-illegal for Cuban citizens to talk to tourists now—officially legal, but discouraged. 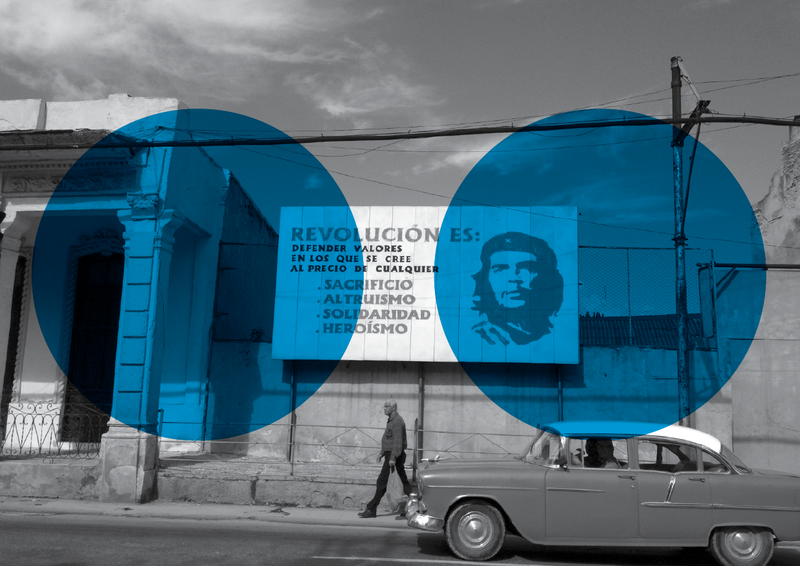 3 A survey of recent Cuban poster design suggests that, yes, this will be the case. Much of Cuba’s contemporary poster design by young designers is increasingly inspired by global trends of the past two decades, notably vector-like silhouettes, humanist typefaces, and architectonic compositions.